Identity/Class: Sub-species of human (Lemurian) mutate? Occupation: Terrorist, former guardian of the Sacred Horde, self proclaimed king. Affiliations: Ancients, the At'la'tique, Black Moray, Fathom Five (Bloodtide, Dragonrider, Llyron, Manowar), Nagala, Oracle Inc.
Powers/Abilities: The Sea Leopard is very long lived, and is allegedly centuries old. He is superhumanly strong, and underwater he has considerable speed, at least as fast as Namor. He has sharp claws and a tail he uses as a weapon with which to bludgeon opponents. He is also a rather formidable telepath and is able to read his opponents mind to know what they will do before they have a chance to do it. His telepathy can be blocked by certain technology such as the Black Moray's armor. He feels that he should be worshipped and claims to have a throne, but is never completely clear over which kingdom (see comments). (Namor I#53 (fb)) - Sea Leopard, is apparently a member of the Ancients with largely undocumented origins. (Namor I#52 (fb)) - In 1915, Ernest H. Shackelton and his crew, carried Antarctic Vibranium, also known as anti-metal, mined from the region on his ship called The Endurance. The anti-metal melted the metal of the ship, sinking it in the process. The crew members of the ship were met by Sea Leopard demanding that they come to him for violating "the sacred horde." Sea Leopard spent the next several decades guarding the Antarctic Vibranium which he referred to as the "sacred horde." (Namor I#53 (fb) - BTS) - Some time after Destiny (Paul Destine) destroyed Old Atlantis, Sea Leopard made it his home. (Namor I#53 (fb)) - Decades later, Sea Leopard made an agreement with Black Moray. According to the agreement, Black Moray would give Sea Leopard one worshipper for every ounce of anti-metal he allowed Black Moray to take from the "sacred horde" that he believed was still within The Endurance. (Namor I#52)- Andromeda came to Old Atlantis looking for Attuma, but when she got there she found that Attuma had been decisively defeated by the Sea Leopard. Sea Leopard promptly defeated Andromeda as well. Later, when Namor chased Black Moray to Old Atlantis, he too encountered the Sea Leopard, who was holding the unconscious forms of Attuma and Andromeda in his hands. (Namor I#53)- Sea Leopard and Namor fought, with Sea Leopard holding the upper hand by reading Namor's mind and dodging his punches before they were thrown. Attuma and Andromeda rejoined the fight, siding with Namor against Sea Leopard, but found that they were still unable to incapacitate him. While Sea Leopard was distracted by his fight with Andromeda and Attuma, Namor first destroyed the remains of The Endurance, and then stole Black Moray's armor, which blocked Sea Leopard's telepathy. 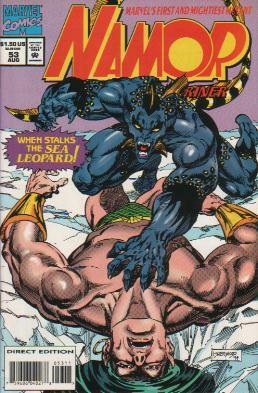 Without being able to read Namor's mind, Sea Leopard was quickly knocked unconscious by Namor. It was decided that Attuma would decide Sea Leopard's punishment. (New Thunderbolts#1 (fb) - BTS) - Sea Leopard apparently escaped from Attuma's judgment and joined Dragon Lord, Manowar, Bloodtide, and Llyron in forming the terrorist Atlantean group called the Fathom Five, dedicated to exterminating humanity from the face of the Earth to ensure the well being of the Atlanteans beneath the sea. 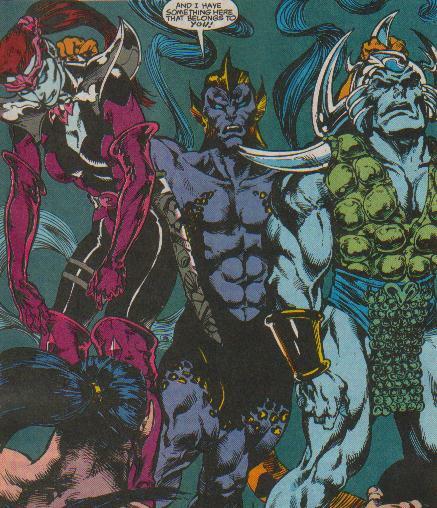 The Fathom Five operated as a super powered strike force for a renegade faction of Atlanteans called the At'la'tique which was connected to Baron Strucker of Hydra in an undisclosed way. (New Thunderbolts#1) - Sea Leopard and the rest of the Fathom Five attacked New York City. Before long, they were opposed by the Thunderbolts. Though the Fathom Five gained the early advantage, the arrival of Captain Marvel forced the Fathom Five to retreat back into the Sea. (New Thunderbolts#3) - Atlantean troops, fighting on behalf of Namor, attacked the Fathom Five, but Sea Leopard and the other villains mercilessly slaughtered them all. (New Thunderbolts#5) - Sea Leopard and the Fathom Five attacked the city of New York again, badly damaging the Brooklyn Bridge. Sea Leopard assisted Llyron and Dragonrider in toppling Atlas, and then assaulted a powerless Mach-4. However, as Sea Leopard stood gloating over Mach-4, he was surprised and knocked out by a super speed attack from Speed Demon. (New Thunderbolts#6 - BTS) - After the conflict was resolve, several members of the Fathom Five were incarcerated. However, Sea Leopard escaped. The Ancients were Lemurian Homo mermani, but they were nothing like the Sea Leopard. Whatever changed him is unknown. Perhaps he's one of the children of Jhandark or Bekkit, or perhaps he was some experiment that escaped after Pyscatos' death? When I first read the stories, I thought he was supposed to be king of Old Atlantis, but I'm pretty sure he never was. Maybe he was just insane. The Old Atlantis they refer to is the city that was in that same area, and was affected by the Oracle's Icebreaking, and probably the one demolished by Destiny. I don't think Sea Leopard was ever king of it.